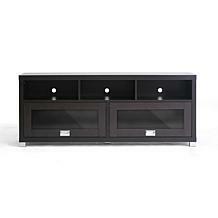 Bring home a touch of the Orient with this stylish espresso media stand. 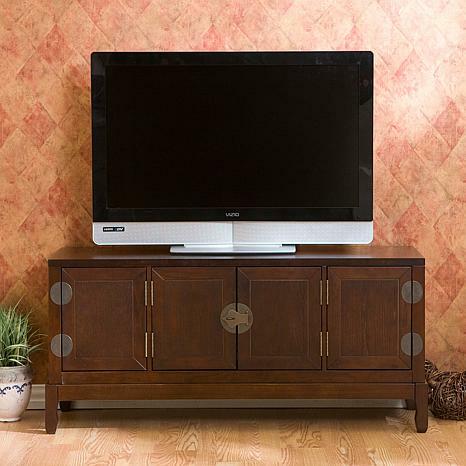 The low design and decorative- metal hardware create a stylish focal point for up to a 50" flat screen television and all of your media equipment. 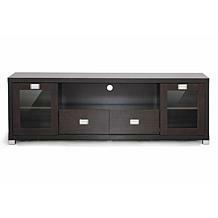 An adjustable shelf is present behind the center doors for large receivers, media players and game consoles while the side cabinets have one adjustable shelf each and are perfect for DVDs, CDs and games. 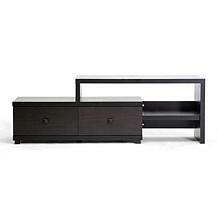 Very stylish and good quality; excellent for small spaces. It is exactly as described. I am very pleased with the ease of construction and the quality of the materials. I purchased this cabinet for my bedroom. I liked it because of the color of the wood and the sturdy construction. 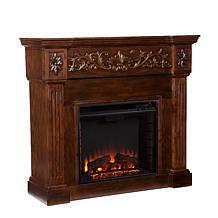 I also like it because it looks a bit oriental in design and my bedroom has that influence. It is really well made. I did not attempt the assembly on my own. I had help and I would think that it would be difficult for one to do alone. I recommend this product. I was very pleased with the quick shipment of this piece and UPS delivered the large 100lb box inside my apartment. The instructions and parts were labled perfectly and asssembly was farely simple except for putting on the doors if you are doing it by yourself it is hard to hold the door and hinges in place with one hand while using the screwdriver in the other. The electric screwdriver was a must at this part! Beautiful piece that looks great and exactly like the picture on the website.